Kite paper can be just about any kind of paper, but making kites fly really well requires more than just ordinary writing paper. The main properties required are strength and light weight. Gift wrap's not bad. Having said that, I'm going to touch on the whole variety of paper used in modern kite-making. Now, let's pause here for a moment. Yes, you can't get the absolute ultimate in kite performance out of ordinary copier paper. But I've taken that as a challenge! 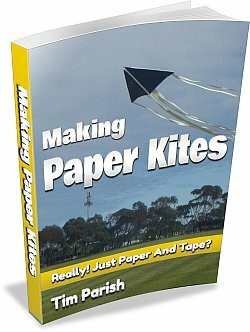 Making Paper Kites is a printable download describing all the Paper Series kite designs. A few moments with my thinking cap on resulted in 3 very broad categories, to answer that question. Curiously, the MBK Paper Series doesn't really belong in any of them! But never mind. Not surprisingly, this approach tends to result in .... minimum performance too, but that doesn't stop loads of people enjoying the thrill of making something themselves and then seeing it fly! 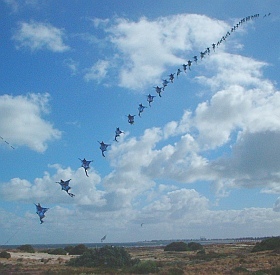 Long tails are often required to keep the kites stable, and they won't fly at all in light winds since the paper and tape can be rather heavy. Of course, kids can always tow them around to make them fly. The majority of these kites probably fall into 2 categories - Sleds and Paper Planes. Yes, one of the most well known of these does look somewhat like a paper plane, except that a bamboo skewer or straw is taped across it to function as a horizontal spar. Due to the small size of these designs, most of them can be flown on sewing thread lines. What's the most commonly available kind of paper on the planet? A4 or Letter sized sheets of course, as commonly used for photo-copying. These are too heavy for great performance, but can be coaxed to fly as proven by the kite designs already mentioned. In fact, the picture up there is our Minimum Sled design. Crafted from a single sheet of A4, and precious little else! Although kite-making tradition goes back 100s or even 1000s of years in various locations, modern kite makers in Asia are still churning out large volumes of paper kites which are very faithful to ancient traditions. 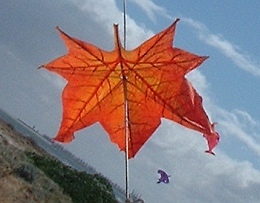 Often, the kite paper and techniques used are virtually unchanged. China, India and Japan have kite-making entwined through their cultures. 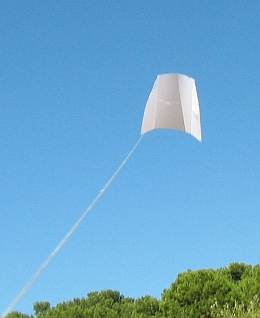 The major sail material for traditional-style kites is paper or tissue. As you can see in the close-up photo of a Taiwanese leaf kite. A pretty good representation of a leaf don't you think? And in the next photo you can see the whole train of traditional Taiwanese kites that we saw at the Adelaide Kite Festival one year. Tissue paper and bamboo construction, all attached to a single natural-material flying line. Most of these kites are superb fliers. I will never forget my Indian kite which I bought as a teenager. It was my first experience of a high-performance single-liner. Apparently, the art of hand-making extremely strong but light kite paper originated in China before finding its way to Japan. In Japan, this 'Washi' paper is often created from the bark of mulberry trees. The final product is laminated from thin layers of fiber, one on top of another. It's the long length of the fibers which gives the extra strength. Commercially made paper created from wood-pulp just can't compare! 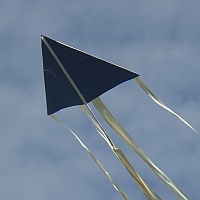 Indian fighter kites are traditionally made from tissue paper and bamboo strips, although modern versions often use such materials as Mylar or plastic sheet as well. Modern re-creations of these kites work adequately with tissue sheets from newsagents or gift shops. As long as the tissue has relatively low thickness, weight and stretch, it is fine. However, the Indian makers of the best fighters have their own special sources for tissue paper. Have fun experimenting with all kinds of kite paper! I might try a big newspaper kite myself one day, I'm curious. Making Paper Kites is a printable download which provides step-by-step instructions for several well-tested designs. Keep them dry, handle with care and they will return many hours of flight time for you!